Display custom post type items available in your choice using widgets and shortcodes. From number of items, its order and elements to display. It’s just too good to have that availability to add list of post types anywhere in your website. You can display items of custom post types of your choice almost anywhere in your website using the widget and shortcode. Display types available are Titles only with links, Titles and Featured Images with links, Titles and Teasers only with links and Display All. Order of display has also two choices either random or latest post. BACKUP everything before you install the plugin. Update the Permalinks on settings. Look for Sherk Custom Post Type Displays and drag it to the widget region you would like it to be shown. 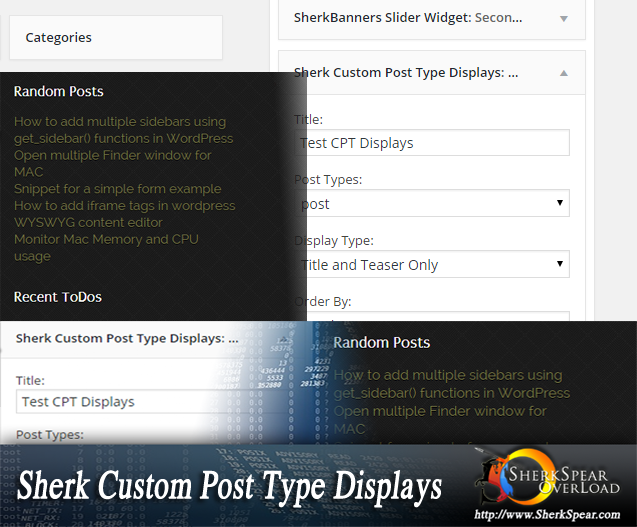 Configure your Sherk Custom Post Type Displays, add a title, select the post type, select the display type , select the way it’s ordered and the number of items to be displayed. After installed check at Dashboard -> Tools -> Sherk CPT Displays (/wp-admin/tools.php?page=sherkcptdisplays_info) for more detailed instructions. Copy the shortcode, paste it to the content text editor and update the values of your shortcode parameters depends on what you need.